With the shale revolution that has occurred over the last half decade, oil and gas operators in the Permian Basin have begun experimenting with their recipes for hydraulic fracturing, most noticeably the type of proppant, or as many call it, frac-sand. 40% of all sand on the Union-Pacific rail line currently terminates in the Midland-Odessa area and with over a half dozen facilities currently operating, a half dozen more set to be operational by Summer 2018, and a total of 20 set to be online come 2019, it is fair to say that the frac-sand mining industry is booming. Operators are largely turning to the regionally produced sand because in doing so, it reduces their frac-sand logistical costs by 40%. Nearly all of the mining operations are located in either Ward or Winkler Counties with a few in Ector, Crane, and Upton. With outputs in the 3-5 million MTPA per facility and daily truck traffic ranging from 350-750 trucks daily, we are seeing nothing short of a frac-sand revolution. With any great boom, comes an even greater stress on infrastructure, specifically along SH 302 and SH 18 in Ward and Winkler Counties where a majority of the mining facilities are located. Nearly $10 million in funding has been allocated along FM 6542 in the form of a bridge replacement project that is currently being completed at Salt Creek, as well as road improvements along RM 652 for 5 miles from US 285 to the Pecos River with completion expected by September 2018. Construction will begin this summer on this $12.5 million project, which goes from US 285 to just east of East FM 1933. The project spans about 5.6 miles. The project is scheduled to take 15 months to be completed. US Highway 67 stretches among more than a dozen counties, but with reference to our energy impacted region, the highway is seeing over $110 million in improvements underway in Irion, Reagan, Upton, Crane, Reeves, and Pecos Counties. The focus of this southern Permian Basin east-west corridor is to widen the 2-lane highway to a “Super 2” freeway which creates alternating passing lanes throughout the length of the road. In late 2017, TXDOT began a study of the US 67 corridor from just south of I-10 to the border at Presidio, Texas. While there had been some previous improvements related to passing lanes on portions of the roadway, there are still safety issues on the portion of the roadway between Presidio and Marfa. The corridor plan addresses safety and operational improvements to facilitate border trade and commerce, as well as tourism. The corridor may become more significant to the energy industry in the future with a new natural gas pipeline installed along much of the route that exports natural gas to Mexico, and development of new wells in the Alpine High play. The corridor study will be completed in 2019 and will include priority projects for consideration in various funding programs. Five projects worth approximately $100 million have been planned over the next few years along US Highway 285 in Reeves and Loving Counties from south of Pecos to the New Mexico County Line. The focus of these projects is on widening the existing 2 lane highway into a “Super 2” freeway which creates alternating passing lanes throughout the length of the road. Construction has already begun on the first phase of the 10-mile project from County Road 232 to State Highway 302. The rest of these projects are slated to begin by Summer 2019. 2016 saw another important leap forward for MOTRAN with the expansion of US 385 announced by TXDOT. 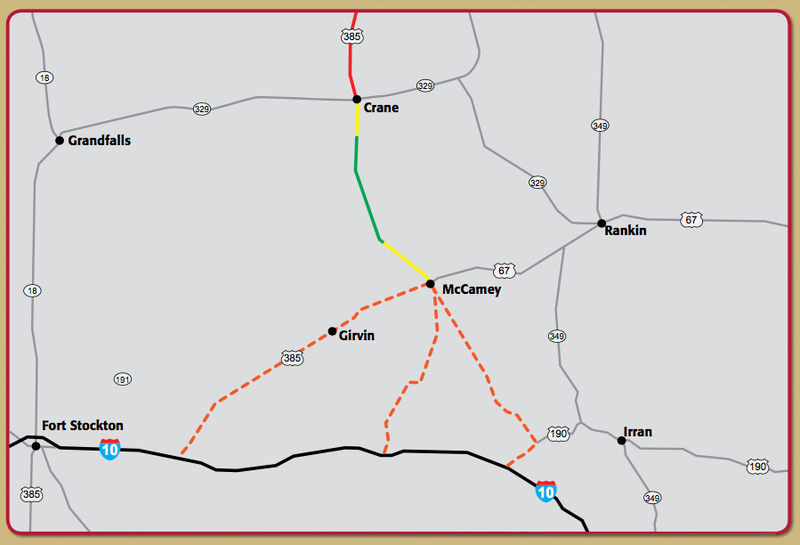 The move came as part of Unified Transportation Plan revisions which authorized the department to update previous planning work on the 2 lane stretch between Crane and McCamey, as well as provide funding for the first two phases of construction on the project. The Odessa District is working with consultants to update the topography and right-of-way maps, and construction on the first phase of the project is slated to begin in January of 2018, with a total projected cost of just over $56 million. In 2010, we launched our FIX349.com campaign to build public support for the expansion of State Highway 349 between Midland and Lamesa. Despite all our previous efforts to improve this two-lane, poor quality roadway, transportation officials did not deem the project worthy. Despite traffic increases, crashes and fatalities, and previous promises made to improve this roadway, the answer we got back, time after time, was simply, no. That is, until they heard from you. Thousands of folks from the Permian Basin and Texas registered online with your comments and support for this project. Today, State Highway 349 from Midland to Lamesa looks very different. As a four-lane roadway with improved shoulders and rumble strips, it has more capacity and is far safer to travel. Work still continues on the southern cross or direct connector between SH 349 and US 87, just south of Lamesa via an expanded FM 2052. This project provides a better connection between the two roads, prevents traffic from having to connect by driving through residential and school neighborhoods to get to US 87, and improves safety at the intersection of SH 349 and SH 137. When this project began, we never imagined we would have a real-life angel on our side. Jami and her children lost their husband and father, Mark Owen, in a tragic crash on SH 349, and our community lost a treasured soul. Jami turned the pain and grief she and her children suffered into determination and resolved to make this road safer and ensure that others would never have to experience the terrible loss she and her family did. Her heart, determination, and leadership made this project a reality, and has taught us all how to persevere and be positive even in the most painful situations. Thank you, Jami!